Many of you have probably seen the box office hit I Am Legend (2007) starring Will Smith. 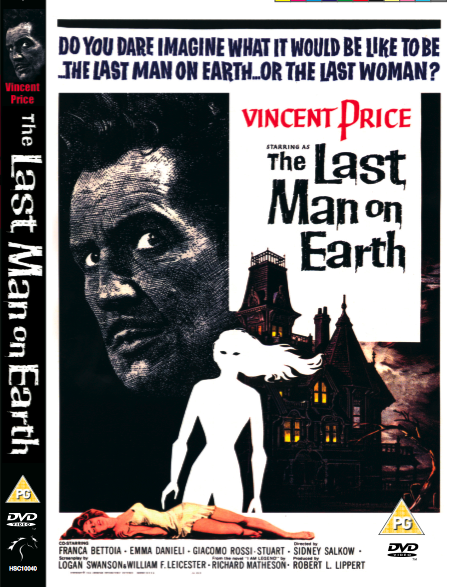 If you found the entire premise fascinating – a post-apocalyptic world dominated by vampiric zombies infected with a nasty virus – you should watch its predecessor, The Last Man On Earth starring Vincent Price and directed by Ubaldo Ragona and Sidney Salkow. It was released way back in 1964 and is now considered a classic film in the science fiction/ horror genre, influencing a host of popular films such as Night of the Living Dead. The Last Man On Earth is based on Richard Matheson’s classic sci-fi novel I Am Legend (1958). It tells the story of Dr. Robert Morgan, a scientist who became immune to the plague that devastated the world, thus becoming the last man on Earth. Those who has been infected by the plague appeared to have become vampires, fearing sunlight, mirrors, and garlic. While they sleep, Morgan has taken it upon himself to kill as many of the vampires as possible and burning them before the sun sets. One day day he meets a mysterious woman named Ruth. He suspects her to be a vampire, but she reveals that everything is not what he thinks it is. The film was shot in Rome, Italy (the Italian title is L’ultimo uomo della Terra) and was later on moved in with a theatrical release in the United States by American International Pictures. It wasn’t widely well-received during its initial release but after almost half a century it is now considered a classic in the genre. It popularized post-apocalyptic films and how disease might bring about the end of the world as we know it. Just a side note: don’t expect awesome special effects. This was made in 1964, after all. What will make this film worth your time is Vincent Price’s stellar performance, hailed by critics as his best. Of course, this is the film that started it all, too, and you might want to witness how the genre evolved. The Last Man On Earth is now part of the public domain. You can download more file formats from it Archive.org page: 355MB Ogg Video, 360MB 512k MPEG4, or a 2.3GB MPEG2. I read the book when I was 16 after seeing the Charlton Heston version. After finding out about this version, I hunted int down through the local library. It was well worth it.